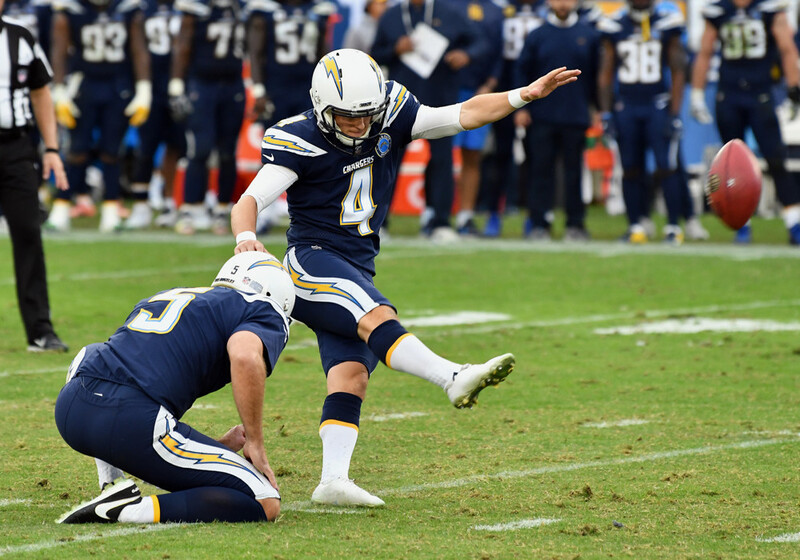 Rookie Michael Badgley kicked four field goals, including a team-record 59-yarder on the final play of the first half, as the Los Angeles Chargers defeated the injury-depleted Cincinnati Bengals, 26-21 Sunday at StubHub Center. Philip Rivers completed 19 of 29 passes for 220 yards and a first- quarter touchdown as the Chargers won for the ninth time in their past 10 games, improving to 10-3 for the sixth time in their 59-year history and first since 2009. Badgley’s record-setting field goal came one play after a 5-yard sack of Rivers was nullified by an offside penalty against Cincinnati defensive end Jordan Willis. The previous record was 57 yards by Nate Kaeding on Dec. 21, 2008. Badgley also kicked a 31-yard field goal in the third quarter, a 32- yarder with seven minutes, 45 seconds to play and a 45-yarder with 49 seconds left. The Bengals cut the deficit to 23-21 on Joe Mixon’s 1-yard touchdown run with 1:50 remaining, but quarterback Jeff Driskel was sacked by defensive lineman Darius Philon on the two-point conversion attempt. It was the second time in the game Cincinnati missed a two-point conversion attempt. Driskel completed a pass to Giovani Bernard on the conversion attempt following Driskel’s 6-yard touchdown pass to former Long Beach Jordan High School standout John Ross 20 seconds before halftime, but rookie safety Derwin James tackled Bernard on the 5-yard line. The Bengals have not made a two-point conversion since Oct. 4, 2015. Their 57-game streak without a two-point conversion is the NFL’s longest active streak. They have missed all three attempts this season. Chargers safety Adrian Phillips recovered Cincinnati’s onside kickoff attempt following Mixon’s touchdown at the Bengals 44-yard line. A 10-yard illegal block against above the waist penalty against Bengals safety Clayton Fejedelem on the kickoff advanced the ball to the 34-yard line. Badgley kicked his final field goal three plays later before a crowd announced at 25,358. Cincinnati began its last drive on its own 23-yard line with 49 seconds left. Driskel threw an incomplete pass, was sacked by Uchenna Nwosu for a 9- yard loss and completed a 9-yard pass to Cody Core on the final play as the Bengals (5-8) lost their fifth consecutive game. Cincinnati led in total offense, 295-288, first downs, 19-17, and time of possession, 32:38-27:22. Mixon ran for 111 yards on 26 carries. With the victory, the Chargers remain one game behind the Kansas City Chiefs in the race for the AFC West lead. The two teams will meet Thursday in Kansas City. The Chargers scored both touchdowns on their first two possessions. They took the opening kickoff and drove 75 yards on six plays, culminating with Rivers’ 14-yard touchdown pass to Keenan Allen, one play after Austin Ekeler’s 15-yard run. Rivers completed both his passes on the drive for 33 yards and ran for 5 yards on the opening play. Ekeler, starting in place of the injured Melvin Gordon for the second consecutive game, ran for three times for 37 yards. After Randy Bullock kicked a 47-yard field goal on the Bengals first possession, the Chargers drove 75 yards on 13 plays, with Ekeler running the final 5 yards, two plays after he turned a short pass from Rivers into a 21- yard gain. Rivers completed five of six passes on the drive for 71 yards. Driskel appeared to score on a 1-yard run with 5:19 left in the second quarter, but the replay official reviewed the score ruling reversed the call on the field, determining Driskel had given himself up on the 1-yard line. Cincinnati opted to try to score a touchdown on fourth-and-goal from the Chargers 1-yard line, but Bengals guard Alex Redmond was called for a 4- yard false start penalty. Bullock then kicked a 23-yard field goal. Desmond King returned the kickoff following Ross’ touchdown 35 yards to the Chargers 32-yard line. Rivers completed 11-yard passes to Travis Benjamin and Allen, advancing the ball to the Bengals 46-yard line. Willis was called offside on the next play. Cincinnati scored its first points of the second half on Bullock’s 46- yard field goal with 12:12 left in the fourth quarter, cutting the Chargers lead to 20-15. Rivers streak of throwing at least two touchdown passes for 13 consecutive games, dating back to last season, ended. It matched the second- longest streak in NFL history. Rivers has thrown a touchdown pass in 26 consecutive games, the league’s longest active streak. Driskel completed 18 of 27 passes for 170 yards in the second start of his three-season NFL career. Driskel was starting because Andy Dalton, the Bengals starting quarterback since he was a rookie in 2011, was placed on the reserve/injured list because of a thumb injury sustained Nov. 25 in a 35-20 loss to the Cleveland Browns. Dalton is among four Cincinnati players on the reserve/injured list who were starters at the beginning of the season. The others are tight ends Tyler Eifert and Tyler Kroft and linebacker Preston Brown. Three other Bengal starters were also sidelined Sunday — linebacker Vontaze Burfict, offensive tackle Cordy Glenn and cornerback Dre Kirkpatick. Badgley’s 62 points are the most by a Chargers rookie kicker through seven career games. He also holds the team records for most points by a rookie kicker through four games (34) and five games (43). Badgley is the Chargers sixth kicker in two seasons. He was signed Oct. 11 when they needed a fill-in for Caleb Sturgis who had a quad injury. Badgley made all three of his field goal attempts and all seven extra point tries in his first two games, then was cut Oct. 30 when Sturgis was deemed healthy enough to return. Badgley was signed to the practice squad Nov. 1 and returned to the active roster Nov. 5 after Sturgis was cut one day after missing a field goal attempt and two extra points in a 25-17 victory over the Seattle Seahawks in his first game following the injury. Badgley was initially signed by the Indianapolis Colts May 1 as an undrafted free agent out of Miami. He was cut by the Colts Sept. 1 as part of the cutdown to the 53-player regular-season limit.